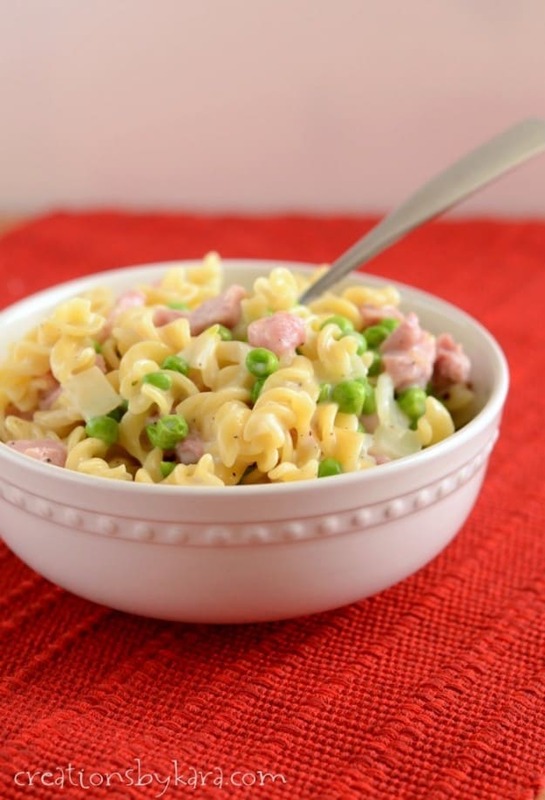 Creamy Ham Pasta with Peas- An easy and delicious way to use up leftover ham. Add fruit salad for a perfect summer dinner! 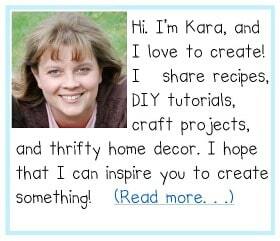 I looked back at the recipes I’ve posted the last few weeks and realized I have been sharing only desserts and baked goods. I promise we do actually eat real, healthy food around here. Summer’s just been so busy that I haven’t tried many new main dish recipes. We’ve been eating lots of tacos for dinner, so not much new to talk about. Pretty boring in the dinner department! But we had ham at my parents for Sunday dinner a few weeks ago, and my mom sent me home some leftovers. It made for a quick and easy dinner the next day. I tweaked a recipe for that I found in an old cookbook that called for cream of mushroom soup. My version has a homemade sauce, and while I didn’t try the other version, I’m sure this one is at least a hundred times better. Fresh always is, isn’t it? Plus you can control how much salt you add. I didn’t add much, because the ham provides plenty. I love it when I can incorporate a vegetable into the main dish. One less pan to wash! 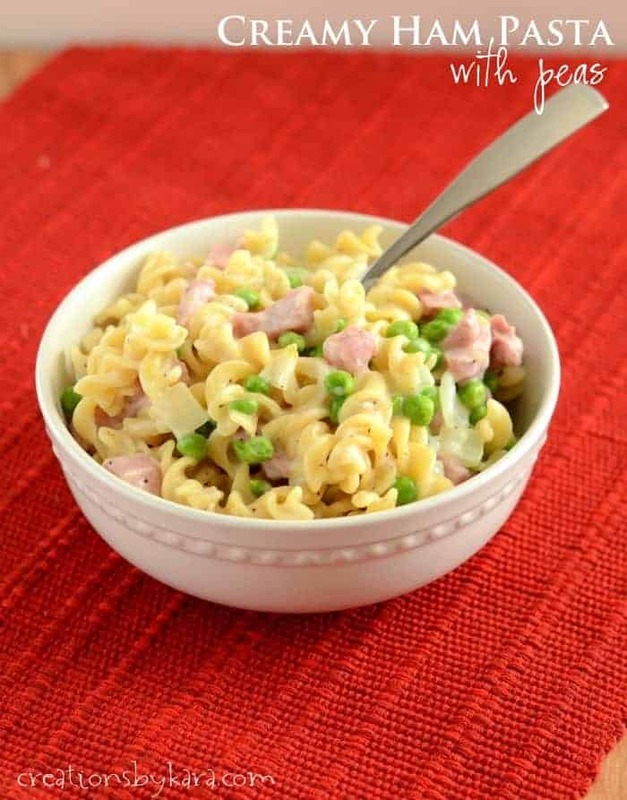 I served this creamy ham pasta with cut up melons and grapes for a perfect light summer meal. My family really enjoyed it with green peas, but you could substitute another green vegetable. I think broccoli or chopped asparagus would also be mighty tasty. Or even green beans- especially if you are lucky enough to have fresh ones! 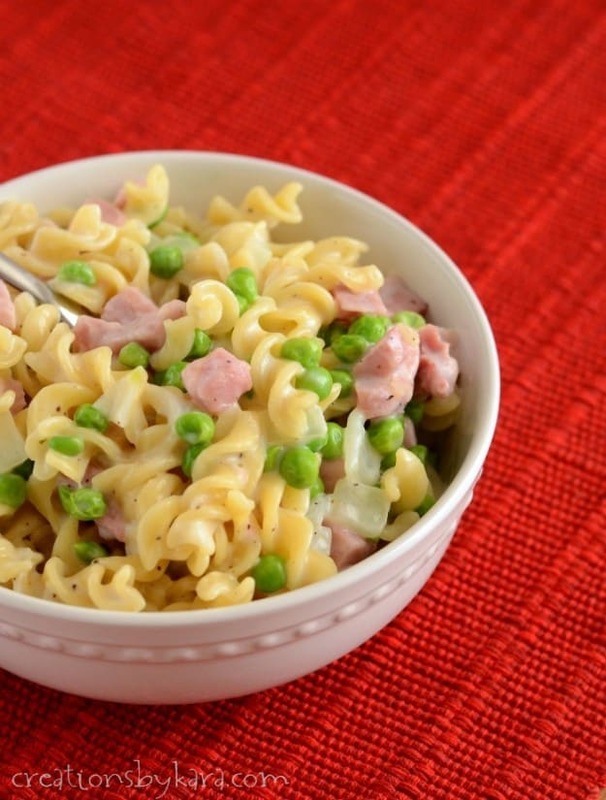 Pasta in a light creamy sauce with ham and peas. Cook pasta in salted boiling water till al dente. Set aside. In the same pot, add the olive oil and onion. Cook over medium heat, stirring often, till onion is translucent, about 5 minutes. Add garlic and cook one more minute. Stir in the flour till all the onions are coated and flour is absorbed. You can add a little more olive oil if you need to. Whisk in the milk and continue cooking and stirring till mixture comes to a boil. Boil and stir for at least one minute. 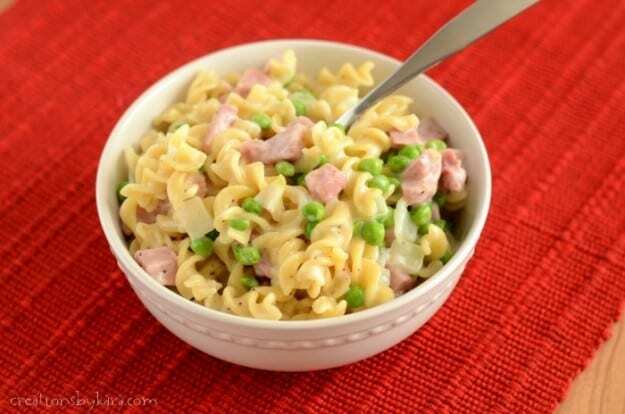 Add pepper, ham, peas, Parmesan cheese, and cooked pasta. Heat through. Add salt and pepper to taste. We’ve made this before and it’s super good! I’m finally getting out the last ham in our freezer (that we bought during last Christmas season), and I can usually get 4-5 ham dishes out of it for my family of 3. =) This is on the menu again for this week!